We’ve all done it… you’ve grabbed what you had on hand to pack up for a move or to store your belongings. The culprits: newspaper and boxes so they remember the Great Depression. 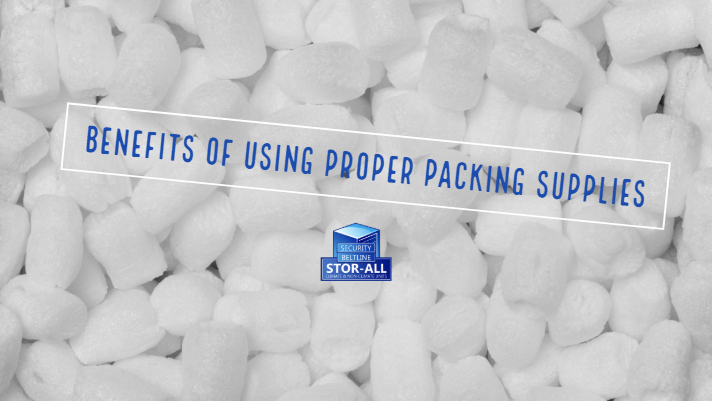 Follow along to discover the benefits of using proper packing supplies. You may think the boxes you’ve used since college can still hold up, right? Unfortunately, the memories inside that box are susceptible to physical damage and moisture with continued use. Over time, the fibers within the cardboard break down causing it to lose stability. The weakened fibers can also let in moisture causing the items to mold or mildew. Choosing high-quality corrugated boxes will ensure your items are protected. These boxes have thick layers that provide extra cushioning. They’re also durable, lightweight and affordable. Beltline and Security Sto-Alls supply a variety of sizes of high-quality boxes for your packing needs. Wardrobe boxes are perfect for storing your clothes in the off-season. They’re a great packing option if you need to store family heirloom items, such as your mother’s wedding dress. Also referred to as garment boxes, these come equipped with an inner metal bar, so you can leave your clothes hanging up inside the box. When it comes to packing, it’s what is used on the inside that really counts. Bubble wrap is essential for protecting breakable items like china, glass, picture frames and those bowling trophies you can’t seem to give up. Gone are the days of using wadded up newspaper to stuff between your books and figurines. If the paper gets wet, it can cause a big soggy mess inside your box. Using packing peanuts will not only reduce the weight of your load because they are lightweight, but they are also reusable. Sturdy, thick packing tape is the best option to top off your box. It keeps the top and bottom of your box secure and limits moisture from getting inside. At Beltline and Security Stor-Alls, we have dust covers and special coverings for mattresses and furniture available. These will keep dust from collecting on electronics and furniture; keeping your items looking brand new. Beltline and Security Stor-Alls carries all the packing materials you need to secure your most important possessions. We supply packing tape, bubble wrap and packing peanuts. Our box sizes are available from small to large to fit your needs. Using the right supplies does more than just help with organization, they safely protect the fragile items that you cherish. We have units from small to large, that are climate controlled. You may only need us for a few months, or you may find that our units fit your long-term plans. Give us a call or come to see us and protect your treasures! Beltline and Security Stor-Alls are located in Mobile, Alabama for all of your storage needs! Check out Beltline and Security on Facebook or visit us online at www.StorAlls.com!